Aria has spent her entire life in a false reality. She prowls computer generated “Realms” through a device known as a “Smarteye” with her friends because real life holds no pleasure. Since the Aether arrived, a strange electrical mist that explodes in storms, humans have had to retreat to domes in order to survive. The land outside the domes is known as the Death Shop and is the home of the Outsiders, savages who sometimes possess advanced senses of smell, sight, or hearing. Realms provide a sense of freedom and allow Aria to travel anywhere at any time in history. Realms allow communication, as well. Aria is still able to sing for and speak to her mother, Lumina, digitally. Lumina was forced to leave Reverie, the dome they lived in together, for her work. Bliss, the dome where Aria’s mother worked, was damaged during an Aether storm and Aria has not spoken to her for several weeks. When a desperate attempt to contact her mother goes horribly wrong, Aria is saved by an Outsider. Perry, the Outsider boy who saved Aria, is on a mission of his own. Perry’s nephew Talon has fallen prey to a disease that will eventually end his life. Trying to find a cure for the malady that is slowly killing Talon led Perry to the dome and Aria. Suddenly, life is turned upside down. Talon is kidnapped by the dome dwellers of Reverie and Aria is abandoned to the Death Shop as punishment for the crimes she committed when trying to speak to her mother. Perry and Aria are forced together to reach their separate goals; finding Lumina and saving Talon from Reverie. 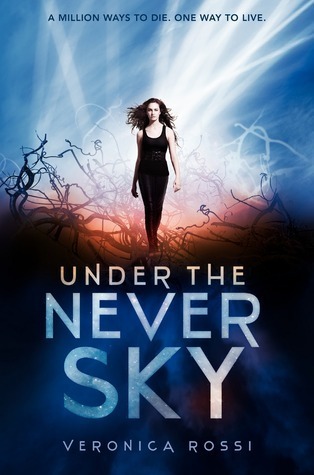 Opening Veronica Rossi’s novel, Under the Never Sky, is akin with falling into a new world. Rossi’s language and style is inviting and detailed. Every character has a face, personality, and history. Ages 14+ and any gender would love this book because of the exciting plot line and interesting characters. I give Rossi’s work five out of five stars. Time used reading Under the Never Sky is time well spent!